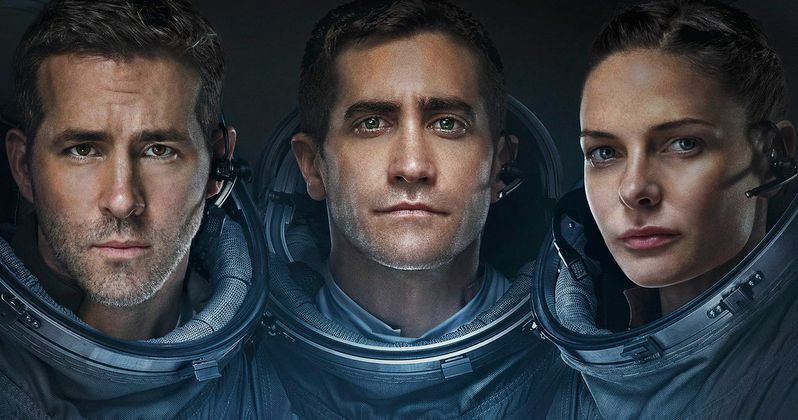 Sony Pictures Entertainment has released a new preview and poster for their sci-fi thriller Life, which examines some of the big issues the film tackles. Instead of having stars such as Ryan Reynolds and Jake Gyllenhaal talk about the movie, the studio has enlisted a pair of real-life scientists, Dr. Kevin Fong, a space and emergency medicine expert, and Dr. Adam Rutherford, who shed some light on the plot and discuss how the issues told in this film would be examined in real life. This should certainly pique the curiosity for sci-fi fans out there, as we get closer and closer to the March 24 release date. Life is a terrifying sci-fi thriller about a team of scientists aboard the International Space Station whose mission of discovery turns to one of primal fear when they find a rapidly evolving life form that caused extinction on Mars, and now threatens the crew and all life on Earth. Sony Pictures Entertainment released this preview on YouTube today, which offers new footage from the film, along with Adam Rutherford revealing that the film opens with this team of astronauts, including Ryan Reynolds, Jake Gyllenhaal, Rebecca Ferguson and Ariyon Bakare retrieving a capsule from space. The footage shows that this capsule contains what might be the first signs of life on Mars, which is fascinating to many because, as Kevin Fong puts it, Mars' conditions and climate was quite similar to Earth's, although that was over 4 billion years ago. We also see footage of Ariyon Bakare's character trying to simulate conditions on Mars, in hopes to reveal that they now have, "incontrovertible proof of life on Mars." If this were to actually happen, Adam Rutherford believes it would be the "greatest discovery in the history of humankind." Related: Is Life Actually a Prequel to Spider-Man Spin-Off Venom? It is also revealed in this footage that every cell is both a muscle and a nerve cell, meaning it's all muscle and all brain. We also learn that life on Mars was extinct for millions of years, but somehow this creature survived. When Ryan Reynolds' character asks what causes the extinction, the video comes to an end, with a blood-curdling scream. We've seen in earlier trailers that this seemingly tiny and innocent life form is actually quite powerful, attacking Ariyon Bakare's character and putting their mission, and lives, at risk in this sci-fi thriller. This video ironically comes exactly one year after we reported that Ryan Reynolds joined the cast. It isn't clear when exactly production took place, or how long filming lasted for, but this project also reunites Ryan Reynolds with his Deadpool writers Rhett Reese and Paul Wernick. The actor and writers are also set to reunite this summer when filming begins on Deadpool 2, which is being eyed for a 2018 release. Daniel Espinosa, who previously worked with Ryan Reynolds on Safe House, is directing Life, which will hit theaters on March 24, going up against Lionsgate's Power Rangers and Warner Bros.' CHiPs. Take a look at this new preview and poster for Life below. Did This Life Trailer Just Recycle Spider-Man 3 Footage?